The water and recycled water program provides safe, clean and reliable water for potable, fire protection, and recycled uses. 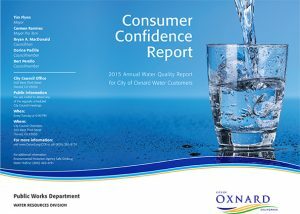 Our water meets or exceeds regulatory requirements and is produced in a cost-effective manner to ensure the health and safety of Oxnard residents and visitors. Water Conservation and Education Program protects future water resources through effective conservation practices by providing education and training, funding opportunities, and technical assistance to all City water customers. Activities include public outreach, classes, education, monitoring, and enforcement programs to promote good stewardship and the efficient use of the City’s water resources. Right now it pays to save. Learn more about how you can save water and money with residential indoor rebates, and turf removal and irrigation efficiency devices rebates as well as commercial rebates available to Oxnard water customers. Water Production and Treatment Program supplies the City’s water customers with a reliable potable water supply utilizing both imported water and groundwater treated at the Desalter to produce a product that is both aesthetically pleasing and meets or exceeds current Federal and State drinking water standards. Water Distribution Program is responsible for operation of and maintenance to the City’s system water pipelines and appurtenances, in order to provide high-quality, reliable, pressurized water service to the City’s residents in compliance with all regulatory requirements. Water Metering Program provides accurate metering, leak detection and customer service to the City’s residents. Water Resources Program is responsible for long-range water resources planning and enterprise business administration in order to minimize the loss of the City’s existing water supplies to competing uses, advance the development of new water supplies, and ensure stable long-term operations for the City’s water utility customers. Recycled Water Program provides treatment, distribution, maintenance, and regulatory oversight of the City’s new recycled water system, with the purpose of improving water supply reliability by developing local water supplies and reducing dependence upon imported water. Water Quality and Cross Connection Control Program is responsible for the quality of the City’s water supplies, from source to treatment to customer delivery. This program minimizes the risk of distribution system contamination from customer activity and maintains the security of water system facilities. Water Connection Fees Program provides for system expansion and supply development projects due to new water customer impacts and is funded through the Water Resources Development and the Water Capital Facilities fees.